My godmother and her husband, Roly, used to throw the biggest parties. Roly made enormous vats of his two famous fish soups; one white and one red. Over a hundred people would line up, having brought their own bowls and spoons to chow down on both. Much debate was had on which you started with but there was never any debate as to how good they were poured over bruschetta slathered with rouille. All was washed down with equally enormous pitchers of sangria, both red and white. When I called him for the recipe for his famous white sangria, his first words were, “Take 5 gallons of wine”! I’ve reduced the quantities to a slightly more manageable size for this recipe. Even though Roly would serve his white sangria in the summer, I think it makes a wonderful holiday cocktail by adapting the fruits and garnishing with a sprig of rosemary. I hope you enjoy! Mix all ingredients in a pitcher and pour over ice. It’s great to make this the day before so the fruit takes in all the alcohol. Plagued by insomnia of late, I’ve been spending the wee hours of the morning contemplating everything from the big questions in life to the incredibly mundane. Mulling over new ideas for turkey leftovers (which obviously fall into the ‘big life questions’ category) resulted in a 4am stroke of genius: Turquitos. I’m planning on selling the idea to Taco Bell for millions. Even better than the genius name is that they’re incredibly easy to make and are absolutely delicious thanks to Bunches and Bunches’ vibrant Green Chile Sauce which packs such a punch, you don’t need to add anything else. Now I can go back to worrying about the state of the world in the knowledge that I’ve solved this year’s turkey leftover quandary. 1. In a large bowl, mix the turkey and green chile sauce. 2. In batches, wet the corn tortillas on both sides and microwave for 15 seconds between damp paper towels. 3. Put 2 tablespoons of turkey filling down the center of a softened tortilla, top with some cheese and roll tightly. Secure seam with a toothpick. Repeat until all tortillas are filled and rolled. 4. In a large frying pan, heat oil until bubbling and then fry turquitos in batches, approximately 3 minutes per side. Drain on paper towels and serve immediately with sour cream, chopped avocado, lime and cilantro. Ygael’s Harissa is far and away the best I’ve ever tasted – you know when a company only creates one product that they’re confident in its distinction. I’ve been adding it to everything from sandwiches to stews but I knew that it would find its true mate with lamb. The heat mellows with the braising to a multi layered warmth that feels both exotic and homey at the same time. This is a dish that takes a little forethought but hardly any effort and will have your home so filled with the aromas of North Africa that you will wonder why you keep looking up flights to Marrakech. 1. Make several small 1-inch-deep slits in lamb with a paring knife, then rub harissa over entire surface of lamb, pushing some into slits. Season with salt then marinate lamb, loosely covered, at room temperature for at least 1 hour or overnight in the fridge. 3. In a large Dutch oven that fits the shanks in one layer, heat the olive oil and brown the shanks on all sides, approximately 5 minutes total. Remove to a platter. 4. Next, add the carrots and cook for a further 2-3 minutes. Add the wine, making sure to scrape up any of the browned bits with a wooden spatula to blend with the sauce. 5. Return the shanks to the Dutch oven, add the stock and cover with a tight fitting lid before transferring to the oven to cook for 2½ hours. Turn the shanks at least once during the braising. The meat is ready when it’s falling off the bone. 6. To finish the sauce, remove the carrots and shanks to a serving platter and set the pot on a high heat to reduce. Reduce the sauce by half before pouring over the meat and vegetables. 7. To finish, sprinkle with pomegranate seeds and fresh mint leaves and serve with couscous with pistachios and cilantro. There is a Skirt Steak Panino at Swoon Kitchenbar in Hudson, NY that I have literally dreamt about. Last week, while contemplating the 4 hours it would take me to get a ‘fix’, I realized it might be just that little bit more convenient to figure out how to recreate it at home. With Hillhome’s Vidalia Onion Jam and Victoria Amory’s Roasted Garlic Mayonnaise being permanent fixtures in my fridge, it took almost no effort to achieve a very convincing forgery of the original. This sandwich is incredibly juicy and you’ll find yourself savoring the steak as it should be appreciated- messily and carnivorously. Basically, this is not the meal for a first date. It is a sandwich that can only be shared with a true friend who appreciates its goodness. Choose wisely. 1. Slice the rolls in half lengthwise, making sure not to slice all the way through. They should open like a book. Toast them in a toaster oven until just beginning to brown. 2. Spread garlic mayonnaise on the inside of both rolls, making sure to cover all sides. Next, lay 2 slices of Swiss cheese on the bottom half of each roll. Return to the toaster oven or broiler to finish off. Cook until cheese is just melted. 3. Season the skirt steak generously with salt and pepper. Heat the olive oil in a frying pan. Once hot (1-2 minutes), add the skirt steak and cook for 2-3 minutes on each side for rare to medium rare. Remove to a cutting board to rest for a couple of minutes before slicing. Cut the steak against the grain into 1 inch thick slices. 4. Spread Vidalia Onion Jam on the top half of your toasted French rolls. Then divide the steak between the two rolls and top with arugula. I’ve oddly never written about this dish because I believed it to be supremely complicated and fussy to make. Reserved for the most special of occasions, it took on near mythical properties growing up. On a recent trip to London, my mother offered to show me how to make it and, as is so often the case, it turns out to be very easy. Getting an actual recipe from her, though, was not so easy. Everything done ‘all’occhio’ (literally by the eye), I ran after her remeasuring everything she casually threw in the bowl. They’re packed with flavor from the porcini mushrooms and deliciously rich so remember that a little goes a long way! NB: Always be on the look out for large pasta shells. Not as easy to find as they once were, buy 2 packs whenever you see them. 2. Bring a large pot of well salted water to a boil and cook the pasta for 8 minutes. Drain and dry spread out on a large tea towel. 3. In a large pan, heat the olive oil and sauté the spinach with a little grated nutmeg for a few minutes. 4. Transfer to a large bowl and then in the same pan, heat the 2 tablespoons butter and add the garlic and mushrooms. After a few minutes, add the Marsala or sherry and cook for a further 2 minutes until the liquid has evaporated. Add the mushroom mixture to the bowl with the spinach and leave to cool. 5. Once cool, add the egg, ricotta and Parmesan. Season well with salt and pepper and mix thoroughly. 6. Butter a large baking dish that will fit all the shells in one layer. Stuff each shell with a large tablespoon of the mushroom and spinach mixture. 7. In a small saucepan, heat the 1/4 cup of butter, add the light cream and bring to a simmer. Pour over the pasta and then sprinkle with more Parmesan. 8. Bake covered for 20 minutes and then uncovered for 10 minutes. Serve warm. In the last few years, I’ve become slightly obsessed with tacos. My favorite are from a restaurant round the corner from me called Empellon Taqueria. Just writing about them makes me want to run over there for a plate of their skirt steak tacos on which I like to pour their famous smoked cashew salsa. Their tacos inspired me to start experimenting at home. This taco recipe rivals any I’ve had at Empellon and if you find yourself with any Mole Beef leftover (unlikely), I discovered it also makes unbelievable Nachos. 1) Preheat the oven to 350°F (180°C). Season the meat with salt and pepper. 2) In a large dutch oven, brown the meat on all sides over high heat, about 5 minutes per side. 3) Scatter the onion around the beef and cover with mole sauce and bring to a simmer. 4) Cover and braise in the oven until the meat is very tender, about 2-3 hours. 5) Just before you remove the meat from the oven, divide the tortillas in 2 stacks, wrap in foil and put in the oven. 6) Remove the meat to a chopping board or platter and shred with two forks. Return to the pot and stir the shredded beef with the cooked sauce. 7) I like to put the pot of beef in the middle of the table with the tortillas wrapped in a tea towel along with all the fixings and let everyone prepare their own tacos just the way they like them. Doaa and Freda are very serious about their research as they set about creating a new spice kit. Falafel was no exception. Eaten throughout the Middle East, each region makes it a little different. Doaa and Freda decided to go to the source after discovering that falafel originated in Egypt. They combined the influences of both Egypt and the Levant to come up with their unique spice blend. The cumin and coriander are typically the only seasonings used in Egypt. 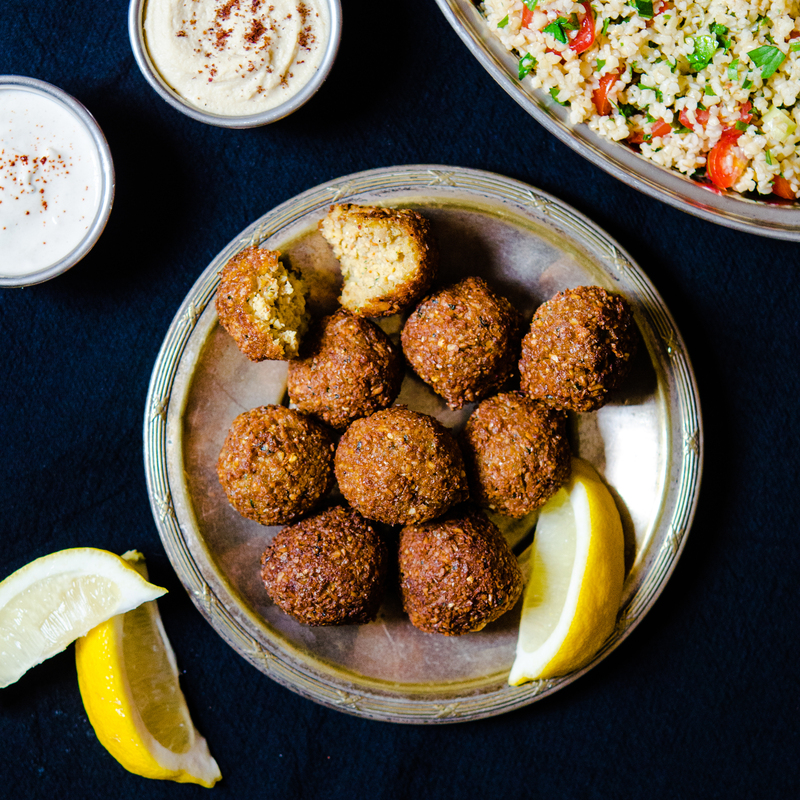 Egyptian falafel is also characterized by the heavy use of spices and herbs, whereas Levantine falafel is less heavy-handed with both. Traditionally, Egyptians would use dried, split fava rather than chickpeas to make their falafel and if you can find them, I would definitely recommend it. Either way, these fried balls of deliciousness are packed with flavor incredibly easy to make at home. 1. Drain the fava or chickpeas, and place them along with the other ingredients and 2 tablespoons water in a food processor. If your food processor bowl is small, pulse the chickpeas first, remove them, and then pulse the onion, garlic, and parsley. 2. Add the chickpeas back to the bowl, along with the spices, salt, baking soda, and water. Run the food processor until the mixture is well combined and finely chopped. 3. If the mixture is not coming together, add more water, a little at a time, until it does. 4. Heat the oil in a large heavy-bottomed pot to 350°F. 5. Take a tablespoon of the falafel and roll it between your hands to form a ball. Press firmly so that the ball holds together and squeeze off any excess water so that you are left with compact falafel balls. Repeat until all balls are made. 6. Carefully deep fry falafel until golden brown, about 2 minutes each (fry in batches of 4 at a time to prevent over-crowding). They will puff up significantly, so do not shallow-fry these! 7. Serve hot, with tahini sauce, hummus and tabouleh salad. 1. Bring a large pot of water to a boil and salt well. 2. Meanwhile in a large skillet, combine the olive oil, guanciale, onion and red pepper flakes. Cook on a low heat for about 10-12 minutes until the fat has rendered and the onions are softened. Raise the heat to medium for a few minutes so the onions and guanciale begin to brown. 3. Drain most of the fat and add the tomato sauce and bring to a simmer. Cook for approximately 5 minutes on a low heat. 4. While the sauce is cooking, cook the bucatini until al dente, drain and add to the simmering sauce. Cook for a further minute stirring well. 5. Serve with freshly grated Parmesan cheese. This dish is street food in the best sense. Spice Tree Organics have wonderfully recreated the delectable flavor that so many New Yorkers crave on their lunch breaks and often wait in long lines to savor. Whether you’re a fan of Halal Cart Chicken or just looking for an easy weeknight dinner, you should give this a try. It far surpasses any I’ve tasted on the street and making it at home, I can ensure it includes only the freshest ingredients. 1. Mix the vinegar, 1 tablespoon oil, spices, and salt in a bowl. Add chicken and mix to coat well. 2. Refrigerate and let sit for 2 hours to marinate. 3. Heat remaining oil in a skillet and sauté onion until translucent, about 5 minutes. 4. Add chicken and cook thoroughly for approximately 10 minutes. 5. Serve alongside turmeric flavored basmati rice and white sauce, recipe below. 2. Refrigerate for one hour to allow flavors to combine.